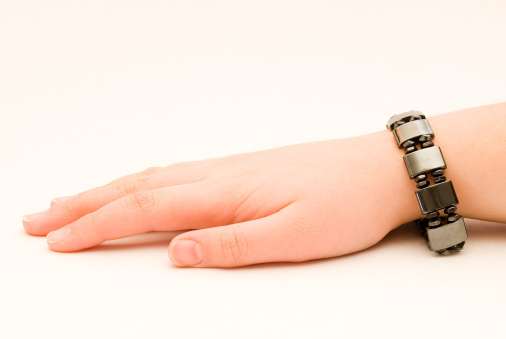 Long thought to ease the symptoms of rheumatoid arthritis, copper and magnetic bracelets are now being deemed “useless” by a team of researchers in the U.K. According to a research team from the University of York, copper bracelets are little more than a placebo. The study gave 70 patients between the ages of 33 and 79 suffering from rheumatoid arthritis four different devices to wear over a five-month period while providing regular reports on their pain and levels of medication use. Each patient also provided a blood sample every five weeks over the course of the study. At the conclusion of the study, the researchers found that copper and magnet bracelets had nothing more than a placebo effect on the patients. Rheumatoid arthritis affects 1.5 million Americans, with many patients turning to costly medications or natural remedies to ease pain. Studies have shown that some natural remedies, such as yoga, and meditation can ease the pain of rheumatoid arthritis. More recent studies have shown that the sulforaphane in broccoli can slow down the destructive process of joint cartilage damage, which can lead to osteoarthritis. However, while I love advocating natural remedies, this study recommends forgoing copper and magnetic bracelets in favor of supplements such as dietary fish oils, which have more science behind them. It’s estimated that copper and magnetic bracelets have sales of a billion dollars worldwide and have been popular since the 1970s. The study noted that wearers typically put the bracelets on when they have a flare-up of rheumatoid arthritis and as the pain subsides naturally, they may think that the bracelet is causing the pain to subside. The study also states that using these bracelets can be harmful since users may become convinced they have the condition under control, leading to them ignoring potential damage to their joints from uncontrolled inflammation. Instead of relying on this natural remedy, turn to tried-and-true remedies, such as dietary changes (eat sulforaphane-rich vegetables) and easy therapies such as yoga. Rubin, J., “Are Copper and Magnetic Bracelets Effective? Billion Dollar Alternative Medicine Devices Deemed ‘Useless’ By Researchers,” Headlines & Global News, September 17, 2013; http://www.hngn.com/articles/12620/20130917/copper-magnetic-bracelets-effective-billion-dollar-alternative-medicine-devices-deemed.htm, last accessed September 20, 2013. Centers for Disease Control and Prevention, “Arthritis – Data and Statistics,” August 1, 2011; http://www.cdc.gov/arthritis/data_statistics/arthritis_related_stats.htm, last accessed September 29, 2013.